Biotinylated Human LILRA3, His Tag, Avi Tag (LI3-H82E0) is expressed from human 293 cells (HEK293). It contains AA Gly 24 - Glu 439 (Accession # AAH28208.1). The protein has a calculated MW of 48.7 kDa. The protein migrates as 65-80 kDa under reducing (R) condition (SDS-PAGE) due to glycosylation. 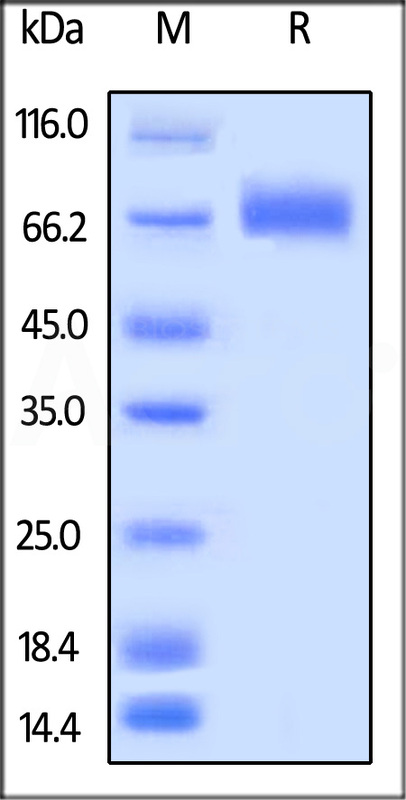 Biotinylated Human LILRA3, His Tag, Avi Tag on SDS-PAGE under reducing (R) condition. The gel was stained overnight with Coomassie Blue. The purity of the protein is greater than 95%. Leukocyte immunoglobulin-like receptor subfamily A member 3 (LILRA3) is also known as CD85 antigen-like family member E (CD85e), immunoglobulin-like transcript 6 (ILT-6), and leukocyte immunoglobulin-like receptor 4 (LIR-4) is a protein that in humans is encoded by the LILRA3 gene located within the eukocyte receptor complex on chromosome 19q13.4. Unlike many of its family, LILRA3 lacks a transmembrane domain, which contains 4 Ig-like C2-type (immunoglobulin-like) domains. LILRA3 acts as soluble receptor for class I MHC antigens. At the same time,LILRA3 can bind both classical and non-classical HLA class I molecules but with reduced affinities compared to LILRB1 or LILRB2. Also,LILRA3 can bind with high affinity to the surface of monocytes, leading to abolish LPS-induced TNF-alpha production by monocytes. (1) Arm J.P., et al., 1997, J. Immunol. 159:2342-2349. (2) Borges L., et al., 1997, J. Immunol. 159:5192-5196. (3) Ryu M., et al., 2011, PLoS ONE 6:E19245-E19245.